* Kicks off with a loud blast of berries – strawberries and raspberries. Very sweet, reminds me of bubblegum. * Initial projection is quite strong. People within a three foot radius will want to lick you up. * The berries calm down and are joined by caramel, cinnamon, and vanilla – making this scent even more edible. * We dubbed this Amber Bubblicious – and that’s a compliment. * Berries stay present as the resinous amber gradually seeps in to be quickly joined by patchouli. * The wonderful amber / berry / patchouli base lasts more than 12 hours on my skin. 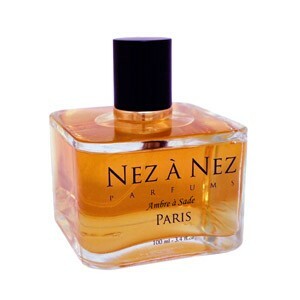 Summary: While at Henri Bendel in New York City, I came across the Nez A Nez line which I had never sniffed before. While there were many delicious fruity scents, this one stood out on first sniff. I nearly bought a full bottle from the top note, but I knew better to wait until I tested. As much as I loved the top notes, the journey and base notes made it even better. Ambre a Sade is definitely not for the office nor for the meek or mild-tempered. This one screams and attracts attention – which is probably why I love it so much. Ambre a Sade is available from Lucky Scent , Henri Bendel , and Aedes de Venusta. I don’t think I’ve tried any perfumes from this line yet. I read people mentioning one scent from this brand or the other but from the top of my head I cannot name a single one that everybody likes so I’m not too anxious to try it. I’ll get to it one day.